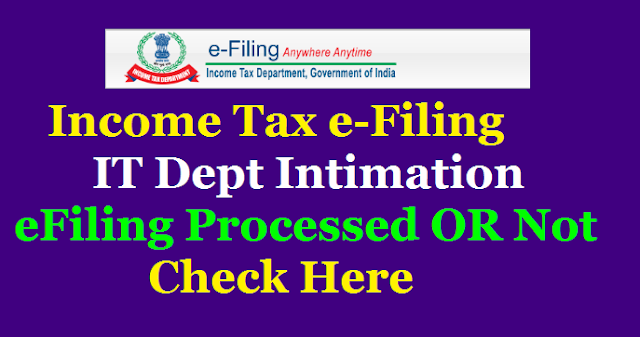 Centralized Prcessing Center sending mails to the Employees and Teachers confirming that their Income Tax Returns for the Assessment year 2018-19 eFiling confirmed ( Processed ) or Not and sending text messages to Registered Mobile Numbers to check and asking to download PDF File protected with password. Know here the Password to open the Income Tax Department intimation Copy regarding ITR 2018-19 eFiling details here. All mailed e-mails in the year 2017-18 (FY) / 2018-19 (assesment year) is from the Centralized processing center in Bangalore with the following message: ITR for PAN: AGFxxxxx1F, AY 2018-19 and Ack No.7398908600XXXX has been processed at CPC.Order u/s 143(1) will be sent by email. The attachment is password protected. To open the attachment, please enter your PAN in lower case and date of birth in case of individual tax payers / date of incorporation for non-individual tax payers in DDMMYYYY format without any space between the PAN and date fields. For example, if your PAN is ABCDE1234A and date of birth /incorporation is January 1, 1985 then the password will be abcde1234a01011985. The date of birth / incorporation should be same as furnished to the Department and available in the Income Tax Department PAN master (as printed on the PAN card). Adobe Acrobat Reader version 5.0 or above can be used to open this attachment. Please note that you will not be able to open this file or veiw the file properly with any version lower than Adobe Acrobat Reader 5.0. The attached digital communication is authenticated by a digital signature obtained from a certifying authority under the Information Technology Act, 2000. The digital intimation is authenticated by a digital signature obtained from a certifying authority under the Information Technology Act, 2000. To know the process of validation of digital signature, please click here https://incometaxindiaefiling.gov.in/portal/downloads10-11/cpc/DigitalSignatureValidation.pdf. 2017-18(FY)/2018-19 (assesment year) సంవత్సరంలో e-ఫైలింగ్ చేసిన వారందరికీ CPC (centralized processing center) బెంగళూరు నుండి కింది విధముగా మెసేజ్ తో పాటు mail కూడా వస్తున్నది. ➤ITR for PAN: AGFxxxxx1F, AY 2018-19 and Ack No.73989086009XXX has been processed at CPC.Order u/s 143(1) will be sent by email. ➤కావున మీరు మీయొక్క మెయిల్ ఓపెన్ చేసిattachment ను download చేసుకొని మీరు చెల్లించిన tax కు వారు పంపిన దానికి ఏమైనా తేడాలు ఉన్నయేమో చూసుకొన గలరు.తేడాలున్న యెడల మెయిల్ పంపిన 30 రోజుల లోపల మనం టాక్స్ పే చేయవలెను. ➤మనం ఎక్కువ tax pay చేసివున్నాకూడాను refund వస్తుంది.అది ఎంత అమౌంట్ వచ్చిందో కూడా ఉంది. తేడాలున్నయెడల మనకు వచ్చిన mail లోనే demand notice పంపివున్నారు. ➤ In case of Demand, this intimation may be treated as Notice of Demand under section 156 of the Income Tax Act, 1961. ➤Accordingly, you are requested to pay the entire Demand within 30 days of receipt of this intimation. గమనిక : జీతం మాత్రమే ఆదాయం ఉన్నవారికి tax లో తేడాలు వుండకపోవచ్చును. Bank deposits & ఇతరత్రా ఆదాయాలు ఉన్నవారు మెయిల్ ఖచ్చితముగా చూసుకొనగలరు..
Login to e-Filing portal by entering user ID (PAN), Password, Captcha code and click ‘Login’. After login, click on the 'e-File' menu and click 'Rectification’ link. Select the 'Order/Intimation to be rectified' as 'Income tax or Wealth 0 Tax' and then Select the 'Assessment Year' from the drop down. selected Intimation/Order and Assessment Year. Select any one of the following ‘Request Type’ from the drop down list. Note:Income Tax Department does not seek any tax payer information like user name, password, details of ATM, credit cards, etc. Tax payers are advised not to part with such information on the basis of emails For any queries, please call CPC on telephone number 1800-1034455 (Toll Free) or 080-46605200 and quote the Communication Reference Number mentioned in the Intimation.